This is part of a window display at a lovely shop called Yolk in Silver Lake in Southern California. 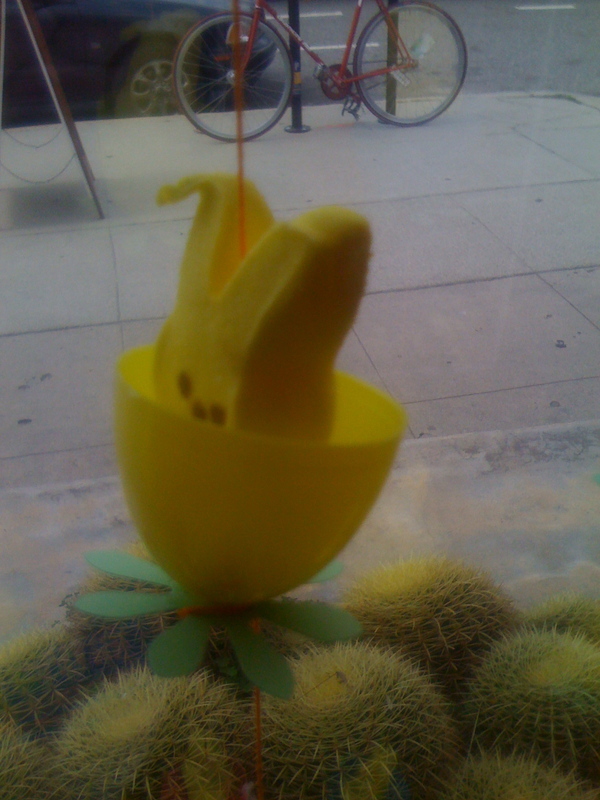 Admit it, even if it is genius to have peep bunnies in plastic egg halves it’s even better to have the one peep bunny that is a tweaker. Maybe he was born different, maybe he got his ear caught in a door, maybe he was in a bunny brawl & it was pulled. So many stories, so many possibilities but the rabbit stays mum. Stoic. An island of sugar silence. Mayhap we should listen to the silence of this rabbit and learn something about ourselves. Or we could just eat him. Posted on March 18, 2010, in Uncategorized and tagged peeps, rabbit, silver lake. Bookmark the permalink. 2 Comments. And he is sitting on a bunch of cactus, lol!